Is Santee Alley L.A.’s most fashion-forward shopping strip? Santee Alley is unlike any other stretch of pavement in Los Angeles. Nearly 20 feet wide, it drops for three blocks through downtown’s Fashion District, from Olympic south to Pico. Map The alley supports more than 200 merchants, immigrants who hail from Kenya, Lebanon, Korea, Pakistan, Vietnam, Iraq, Iran, Jordan, Israel, Mexico, and Egypt. At around one every afternoon the Senegalese drift from the alley’s mouth on Olympic for daily prayer. Santee gets the same foot traffic as Santa Monica’s 3rd Street Promenade and is so cramped and loud and visually exotic, it can remind visitors of medinas in Fez or Tripoli. Its shops don’t have front doors; they have metal shutters that roll up into the ceiling. Because of this, everything that goes on in the alley seems open and obvious. In fact, Santee may be the most mysterious three blocks of public activity in the city. It is known as a twilight economy, an all-cash engine fueled by the largest assemblage of counterfeit fashion merchandise in the country. At the moment, the handbag in highest demand there is a fake Coach, but you can find bogus goods with the names Prada, Dolce & Gabbana, Fendi, Rolex, Levi’s, and Gucci. Santee is also famous for its knockoff fashions—a jacket that’s a dead ringer for the latest from Marc Jacobs or a dress that’s nearly identical to a summer style by Diane von Furstenberg. Store owners from the Philippines and Saudi Arabia fly into LAX empty-handed, purchase several suitcases at one of the alley’s many luggage shops, stuff the cases with counterfeit Prada sunglasses and Rolex watches, and then fly home, where they claim the merchandise as their personal belongings to avoid duty fees. Most visitors, however, are local. The majority are Latino immigrants and their families, but you will see German tourists, Highland Park slackers, even Beverly Hills matrons who tour the area in limousines. Women in their twenties shop the alley because it is as important and exciting as Melrose Place on Black Friday. On a recent afternoon an elderly man dressed in a black leather jacket edged in bright gold piping was bent over a brown-and-tan Louis Vuitton stroller. Inside sat a floppy-eared bunny taking in the air. The bunny and his chaperon were browsing the shop of an Egyptian named Mustafa, who was in a business transaction with a Korean wholesaler that was quickly going south. Mustafa is large and middle-aged, with soft, almost vulnerable eyes. His close-shaved head exhibits a sheen in the sunlight, like a religious dome, and he wears rectangular Dolce & Gabbana frames that build structure into his moon-shaped face. “What about the $9 you already owe me?” Mustafa questioned his wholesaler. Four boxes had just arrived, and the Korean was trying to explain the bill, which was for $472. “I do not owe you $9,” answered Mustafa’s visitor, looking affronted. While the two bickered, an assistant of Mustafa’s would occasionally pop over to slip a pair of sunglasses onto the Korean, whose red, blotchy face seemed to get a lot of sun. Yet every time he glanced in the mirror, he’d return the frames. “My head is too big and ugly for sunglasses,” he said. As with a lot of shop owners on the alley, Mustafa works seven days a week, often from eight in the morning to eight at night. Because of the alley’s foot traffic, Santee’s rents can exceed those of Beverly Hills, running as high as $15,000 a month. Mustafa’s shop, which is found immediately north of the corner of 12th Street, sits on the busiest and most expensive block. Five thousand dollars a month will get just 300 square feet. South of 12th, on Santee’s least expensive block, the same amount can secure 1,500 square feet. Landlords squeeze their properties for income—from one original business, the building that houses Mustafa’s store has been divided into 33 rental spaces—and so shop owners, in turn, must squeeze their own walls. Competition for space is fierce, and fistfights have broken out over a single contested inch. The alley looks like a retail district, but a fifth of the profits in shops is earned from sales to wholesale buyers, who take merchandise to sell in their own stores. Shops like Mustafa’s buy from 30, 40, even 50 manufacturers a month to keep their shelves and tables stocked with everything from blouses to CDs to fake beer cans where you can hide your pot. Mustafa sells handbags, backpacks, blankets, luggage, and sunglasses. He named his shop Moose because it is his nickname and because he has always loved animals. Its sign is a drawing of a moose’s head in profile, one you might see hanging above the entrance of a rural fraternity lodge. Merchants on the alley are famously tight-lipped. “Even I don’t know what goes on down there,” says Elisa Mermelstein Keller, whose family has owned buildings on the alley since the ’70s. Keller thought the odds were against locating someone to speak to me. “Because of the paranoia,” she said, “no shop owner will tell you the story of the alley.” Then I met an LAPD officer named Randall McCain, who has patrolled the alley for two decades. McCain had recommended Mustafa to me as being an aboveboard businessman, vouching for his trustworthiness. After a 20-minute negotiation that covered such topics as why I would want to talk to him, why he would want to talk to me, where and when he could talk to me, and whom he might find to talk to me instead, Mustafa and I finally agreed to sit down in two days at a nearby Starbucks. But first he needed to settle the $9 debt. “Exactly,” said the wholesaler, smiling as if the idea were his all along. The next morning Mustafa called and canceled our meeting after waking up and realizing that as a Los Angeles boutique owner trying to make a living by luring customers into his shop, speaking to a magazine journalist was possibly the worst business decision he could make that month. Santee Alley is home to only a small portion of the Fashion District’s clothing shops. There are thousands surrounding the alley, with names like Lox, Funkberry, Shoe Monster, Mapsi, Vermani, Wonky, Zoot Land, Little Yuppie, Sassy Gals, Crazy Girls, Forever 26, Dancing Queen, Acapulco Bride, Sweet Undy’s, Sexia, and Puppyroo, which appears to sell lingerie for dogs. The alley is encircled by fashion subdistricts: textiles and menswear to the north, women’s and kids’ wear to the east, men’s casuals and athletic wear to the south, and accessories and more women’s wear to the west. Eighty percent of the shops are wholesale, but at least 80 percent of those sell retail on Saturdays. Last year the Fashion District did $5.7 billion in business. The district’s 94 blocks are pulled between twin poles of wholesale activity—the California Market Center at 9th and Los Angeles streets, and the San Pedro Mart at 12th and San Pedro. The California Market Center was built in the 1960s and is the nation’s largest collection of showrooms for fashion companies, with more than 1,000 spaces for lease. When buyers from major stores arrive to look over the collections for an upcoming season, the California Market Center is said to be the giant of the fashion universe. The California Market Center does not figure into the lives of the merchants who work on Santee Alley. For them, the district’s heart is the San Pedro Mart, which holds some 300 garment businesses, most of them Korean owned, as well as its own bank. The first tenet of the Fashion District is that everyone imitates everyone else, and the Korean garment manufacturers are said to be the best at it. “We all know what goes on at the San Pedro Mart,” says Ilse Metchek, who is president of the California Fashion Association. “The Koreans walk over to the California Market Center to see what is hot this season—polka dots or purple or white summer dresses. Then they return to San Pedro and knock it off. We have no idea where the garments are made. They have their own factories that are probably in the Inland Empire and Alhambra and Torrance. The factories are not registered and are operating underneath California law. We have no idea how they get their merchandise. But they can turn it around and get it into Santee Alley in three weeks, whereas a California Market Center showroom has to wait six months to get theirs into Macy’s.” (Neither the Korean Apparel Manufacturers Association nor the Korean American Garment IND Association of California would return phone calls for this article.) When a new dress appears on Santee, buyers from Mexico flood the alley, loading suitcases with garments that are ferried back across the border. This is how shoppers in Guadalajara can stay a season ahead of their counterparts in West Hollywood. In Los Angeles in the 1960s, there was no Marshalls, no Forever 21, T.J. Maxx, Target, Wal-Mart, or Ross Dress for Less. There was the Broadway and the May Company and Bullock’s and Desmond’s. If you didn’t shop the department stores for a summer dress, you likely bought one at a mom-and-pop in your neighborhood. But the mom-and-pops couldn’t afford to enter the California Market Center, whose showrooms only did huge deals with department stores. They couldn’t afford to order 3,000 pantsuits or 5,000 blouses or 10,000 skirts. They needed 3 pantsuits, 5 blouses, and 10 skirts. They needed a jobber. The term “jobber” is rarely used today. A century ago, however, jobbers were found in every industry. There were coal jobbers, watch jobbers, crockery and candy jobbers. They bought merchandise in lots from large manufacturers, then resold it by the piece to small stores and traveling salesmen. In Italy they were called compratori de rimanenze; in Germany, Gelegenheitskaufer; and in Spain they were known as imitación de los compradores del trabajo. No matter the language, jobbers could influence a nation’s economy based on how they priced goods. They were fulcrums of capitalism. Often they congregated in numbers. Omaha’s six-square-block Jobbers Canyon was among the Midwest’s largest remaining jobbing districts until it was demolished in 1989, making way for the headquarters of food giant ConAgra. Santee Alley in the 1970s was L.A.’s own Jobbers Canyon. Its tenants created one of the most popular shopping destinations in the city, and it was all a complete accident. Forty years ago a garment manufacturer would strike a deal to sew, say, 5,000 units of a particular blouse in an array of spring colors for a department store like the May Company. But things might go wrong with the order. Perhaps he accidentally dyes one lot canary yellow instead of daffodil or cuts a sleeve an inch short. Suddenly 1,000 returned blouses are aging in his warehouse. Unsold wine may go up in value, but the price of a spring blouse—as with all fashion inventory—can only drop. Garment manufacturers even have an expression that describes their inventory. They say it grows whiskers fast. Now only a jobber will buy the blouse. It cost $3 to make and would have sold at the May Company for $10, but its worth has since fallen below its sewing price. So the manufacturer sells off his inventory at 50¢ a hanger on Santee Alley. The jobber can sit on the merchandise in his warehouse, waiting for shop owners to walk in, or he can take that blouse on the road—from Hawthorne to Santa Ana, Arcadia to Woodland Hills—and sell it himself. Those men who chose the road over the warehouse were called trunk jobbers. Steven Jacobs was a trunk jobber. In the 1960s, he sold earrings, necklaces, and bracelets from the trunk of his car to drugstores and beauty salons. Today Jacobs is a candle importer who dresses in crisp Polo windbreakers and has the slightly racked, regal air of a man who has seen almost everything. After arriving from New York in 1961, Jacobs moved to Baldwin Hills before relocating to Calabasas because it was where a young family in L.A. could afford a new home. By 1971, Jacobs had a small warehouse on Santee Alley. His front door opened onto Santee Street, which borders the alley, but like all jobbers there he conducted business out the back, where clients would pick up their purchases. One day Jacobs noticed something: On Saturday afternoons nearby garment buildings expelled hundreds of Latina sewers coming off their shifts. The women passed through Santee on their way to the bus stops. Jacobs knew about the district’s immigration raids. He knew about the spotters stationed on every factory floor, about the buzzers that rang out when the feds appeared, and how Latina women avoided the May Company and the Broadway for fear of being picked up and deported. So one weekend Jacobs put out a little card table in the alley and laid down some necklaces and earrings priced at a dollar. Everything sold. Jacobs moved into accessories, expanding from one table to two. He sold handbags and sunglasses, and the sewers bought whatever he put out. They even bought in lots, reselling Jacobs’s merchandise from their homes. He rolled out a Peg-Board, pushed more inventory. Two doors down a leather jobber, watching Jacobs’s weekend business, began displaying leather jackets. He sold out. Then the jobber next to Jacobs hung out racks of women’s casuals. He sold out, too. Santee’s Sephardic Jews were followed by Persian Jews fleeing Khomeini and the revolution, and then the Brazilian Koreans. South Koreans had begun leaving Seoul for São Paulo as early as 1963 in a government-sponsored immigration program. They tried farming the wet, alien Brazilian rain forest but soon turned to what they knew best, manufacturing garments in São Paulo neighborhoods like Bras and Bom Retiro. By the early ’80s, the Koreans had landed on Santee Alley, sewing knockoffs and reshaping the garment district’s economy into one of cash-and-carry, which helped transform Santee from an alley of jobbers into an alley of B-class merchants. Jacobs, Dahan, and other jobbers left the alley to become importers or manufacturers. They had to. The arrival of Marshalls and T.J. Maxx—which buy in lots directly from garment manufacturers—helped put them out of business. Santee Alley became a retail destination known from Auckland to Tel Aviv. Yet unlike the Grove or the Glendale Galleria, it did not begin with a developer’s vision and an equity line of several hundred million dollars. It started with a few pieces of jewelry on top of Steven Jacobs’s three-by-three card table. The moral, of course, is that there is a drought of integrity in the garment business. If someone’s inventory can be knocked off, it will be. One reason for such lax ethics has to do with the unsophisticated nature of apparel manufacturing. You cannot build an aircraft engine in your garage, but you can sew a blouse. Because of this, no one knows how large L.A.’s underground garment industry is. Manufacturers in the San Pedro Mart may send work out to a state-registered contractor, but he can send it to a subcontractor, who in turn will move it into a garage of sewers in Boyle Heights. Even some counterfeiting—the affixing of product labels to sunglasses, for instance, or the silk-screening of a shirt—is performed in L.A. homes. Not every merchant moves to Santee Alley with the desire to sell counterfeit goods. But the LAPD estimates that 80 percent of people browsing shops like Mustafa’s are looking for bootleg merchandise. The alley’s counterfeit sales peaked in 2000. But since then, due to policing, the environment has gotten considerably better for Louis Vuitton and Burberry, if worse for the bottom lines of shop owners. That hasn’t stopped visitors from seeking out phony Coach purses. The alley has its own barometer for measuring how many shoppers on a given day are looking for fakes. After a piracy raid, all you have to do is watch how steeply food sales drop off. How a new merchant finds fake goods to sell is one of the alley’s best-kept secrets, but groups of Chinese and Koreans are believed to be the middlemen between the container ships and the alley’s shops. While the inventory in most shops may be as little as 5 percent counterfeit these days, nearly every store subleases space out front—a Peg-Board or a table or a watch case—to other merchants. A three-by-six Peg-Board that holds a dozen purses can go for $3,000 a month, and so 99 percent of all subtenants are believed to sell solely counterfeit to afford their rent. Often the merchants who operate Peg-Boards and foldout tables make higher profits than the shop owners who rent them their space. For instance, CDs—which are usually burned locally—can net a weekend retailer $100,000 a year. One merchant arrested at his tiny table kept a hoard of fake watches worth $3 million in retail value. Another, who was known to only ride the bus, was seized in a small apartment along with several hundred thousand dollars in cash. As many as 26 vendors have been arrested in a single day and 50,000 items seized from one store. Following a bust, counterfeit suppliers can be unforgiving. “The Koreans are in a network,” says McCain. “After a merchant is arrested and his counterfeit goods seized, trust me, the Koreans make phone calls. If he got that merchandise fronted to him on credit, he’s not getting anything from anyone until he pays off that debt.” Counterfeit can be as lucrative as the drug business, and even with the arrests, a lot safer. Though eight or nine busts occur each week on Santee, counterfeit is not leaving there anytime soon. Buckner keeps a running tally of merchants who have been prosecuted as many as five times, merchants who keep returning to the alley. Added up, it numbers about 50. Sundays begin quietly around Santee Alley. At 9 a.m. its shops are already open for business, but on adjacent Maple and Santee streets, store owners are just beginning to roll out Peg-Boards of merchandise. The boys who watch for the cops wait on corners, slouching drowsily against their bikes. On Wall and Los Angeles streets, each a block away, nothing yet stirs—activity opens outward from the alley like a flower unfolding under the morning sun. Men hauling small plastic coolers on sidewalks call out, “Tamales—pollo and queso tamales!” while along the gutters, fatty wheals of bacon are being wrapped around hot dogs at vendor carts. Twenty-five years ago an Egyptian named Abdul, who had come to L.A. by way of Ohio, was hauling his hot dog cart to Venice Beach when he got lost. He pulled off the freeway, came upon Santee Alley, and set up shop there instead. Business was so good, he asked his friend Mustafa to join him. Together they sold hot dogs on weekends and watched TV during the rest of the week. The alley went nowhere but up, and Abdul soon graduated from the cart to owning restaurants and finally to becoming a wealthy landlord. Mustafa worked for Abdul for 25 years, helping run his businesses, until he ended that relationship to run Moose full-time. 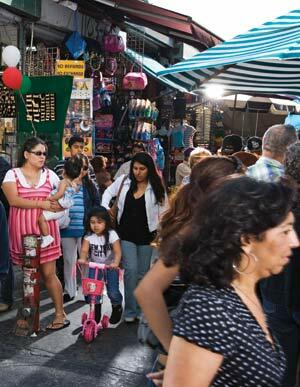 Downtown’s Broadway corridor was the center of Latino shopping the year Abdul stumbled onto Santee Alley. By the mid-’90s, however, sales and foot traffic had begun to shift east from Broadway to the alley. Now, because of incessant construction of new Korean-owned buildings, street activity is being pushed farther and farther east, to San Pedro Street and beyond. It is being moved on to Crocker, to Towne, and eventually—vendors on the alley believe—all the way to Stanford, six blocks away. In business success, the district’s Koreans have eclipsed their forebears, the Jewish manufacturers of the 1950s and the Persian jobbers of the ’70s. The latter two groups worked their way up from tenants to landlords. By the early ’90s, the Persians had established themselves as the most powerful ethnic group on Santee Alley after realizing that instead of working as jobbers, they could make more money buying their buildings and leasing them to new arrivals. They asked for the steepest rents the market allowed. They got them and—when illegal signing bonuses were part of the deal—even more. The Koreans have gone beyond that, adapting to manufacturing, wholesaling, property management, and now real estate development in ways that were unknown in the old garment district. As they expand the new district beyond its borders, however, it is possible that nothing will stop the exodus of Santee shoppers. On weekends you still can’t find an empty parking lot within five blocks of Santee; walking the crowded alley can be an endless negotiation for the next foothold. But in five years’ time, say its shop owners, as visitors are drawn into the growing matrix of new wholesale and retail outlets to the east, the alley may come to resemble nothing more than a lightly populated swap meet. The truth is, Santee Alley was at its busiest when counterfeit was king there, and an economy of knockoffs was flush, drawing newcomers who had known only shopping excursions on Rodeo Drive, Robertson Boulevard, and Melrose Place—visitors who found they could acquire facsimiles of the real thing for a third of the price. Santee acted as a kind of jobber for the Korean manufacturers then. Merchandise moved as quickly as it arrived from the seamstress’s table. Tenants who came from Jordan, Iraq, Israel, and Egypt were paying steeper and steeper rents to Persian landlords. Now rents are on the decline on the alley, and FOR LEASE signs are not uncommon on walls outside shops. The future, as seen from inside Moose, is uncertain.